Last year, when I was completing my 2016 PopSugar Reading Challenge, I needed a graphic novel to read. I read manga some in middle school, but it had been quite some time since I'd read a graphic novel. 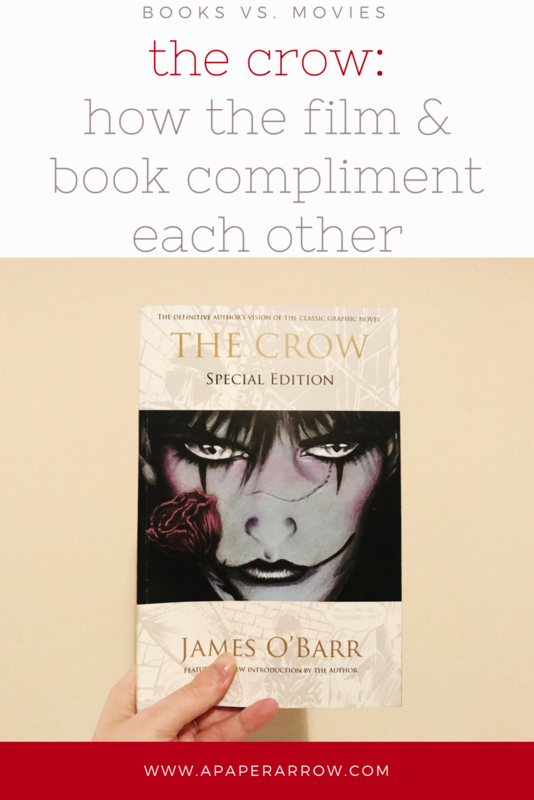 I posted on Facebook asking for suggestions, and my dear friend Emily sent me my very own copy of James O'Barr's The Crow. The story was developed on true events that happened in his life, but of course not totally true life. The novel follows vigilante Eric who is seeking vengeance for his fiancee, Shelli, who was brutally raped and murdered a year prior. While the book and film plot are more or less the same, there are some major differences in the two. Scene of the crime: In the novel, Eric and Shelli are in the wrong place at the wrong time. They run into the gangsters, who proceed to kill them both. The film versions shown their apartment being broken into (I'm pretty sure the bad guys own the building or have a connection here). That is where they are beat to death. Sherri vs. Sarah: In the novel, Eric meets Sherri, a young girl, sitting out on a stoop. Her mom is an addict and she is more or less on her own. Eric gives her Shelli's ring because he wants her to be safe and feel wanted. Her name, being so similar is Shelli's is a major connection to Eric's love. In the film, the girl's name is Sarah - breaking the connection to Shelli - and has known Eric and Shelli for a while. She's a teenager in the film and plays a much larger role than she did in the book. Officer Albrecht: In the book, Office Albrecht is not a main supporting character, but is a main character in the film. He was there the night of Eric and Shelli's murder, and is almost a confidante for Eric. Much like Sherri/Sarah, Albrecht was given more of a connection in the film and plays a major role. The crow friend: In the novel, the crow is a companion to Eric, giving him info (yes, verbally talking to him) and also kind of busting his chops when he starts wallowing in self pity. The film crow is more-so connected to Eric (if the crow dies, then Eric dies). He's also Eric's eyes - Eric can see what the crow sees, but there's no other obvious communication between the two. While I very much enjoyed the novel (you get to know Eric in a deeply intimate way - his pain and struggle), the movie tied everything together nicely in a pretty bow. The film has become a major cult classic, due to Brandon Lee and his on-set death. It is a bit dated, and it's dark and haunting. But the novel is a wonderfully heartbreaking read that is definitely worth it as well. If I had to choose, I would say read the novel. Have you read or seen The Crow? Which one did you prefer? I've actually never read a graphic novel before. I keep telling myself I won't like them...but I know that's probably not true! They are not something I would read regularly, but it's definitely a nice change of pace! I recommend giving a graphic novel a try!